In 1867, a few years after the establishment of the International Working Men's Association, Karl Marx presented his thoughts on the emergence of capitalism in an essay entitled The Origins and Development of Capitalism, as part of his wider discussion on the sociology of capitalism. Marx identified the 16th and 17th centuries as being periods of intense capital accumulation as a direct consequence of the discovery, colonisation and exploitation of the Americas, and the development of maritime trade with the East Indies and China. Thus began a process in the development of commercial capitalism, in contrast to the feudal capitalism that preceded it. So also began the rise of a new class within medieval European society, that is, the capitalist class, or as Marx liked to call them, the bourgeoisie. Medieval society consisted of feudal landowners, a peasantry and a middle level of artisans. Artisans were organised into craft guilds, with entire towns often dedicated to the one craft. Thus the division of labour was across various specialised guilds. Social relations between peasants and landowners, apprentices and masters, etc, was of a hierarchical patron-client type, and more often that not lasted a lifetime, with the patron providing protection and sustenance to their client, in return for the dedicated service and loyalty of that client. The development of a merchant class was a consequence of the emergence of commercial capitalism. The increasing power of this class lay challenge to both the existing ruling class, the land-owning feudal lords, and to the social order underpinning it. Marx contends that two types of producer emerged from the beginning; the revolutionary merchant who's production mode is in opposition to the craft guilds and agrarian economy, and the transitional merchant, who continued to maintain direct possession of production through bringing independent craftsmen under his control, but not disenfranchising them from the means of production. Marx saw these transitional merchants as 'obstacles to the real capitalist mode of production', and that it was just a matter of time before they disappeared. Marx saw this mode of production, where the producer remains in more-or-less direct contact with their product, both as an obstacle to the capitalist mode of production, and also as a future victim of capitalism's development. The transformation from feudal exploitation to capitalist exploitation involved a radical shift in the servitude of the peasant-labourer, and importantly, the separation of the labourer from the soil. The emerging capitalist mode of production was triggered by the relatively dramatic expansion of world trade as a consequence of European advance into the Americas and East Asia, and led to a corresponding increase in the need for trade goods. European production of such trade goods was hampered by the existing inefficient feudalistic modes of production and social-class relationships. In order to meet the demand for trade goods, the mode by which products were produced had to improve. This necessarily involved changing the relationship between the product and the producer. Under the feudal mode of exploitation, the landlord would take a portion of the harvest from the peasant population under his control. The peasants themselves remained in contact with the means of production. Capitalist exploitation requires that the labourer be separated -- or alienated -- from the means of production, becoming a 'free' labourer; free to be exploited as a wage labourer, rather than as a chattel of the feudal lord. It thus becomes necessary for the existing feudal relationships to be broken down in order to produce a pool of free labourers that the capitalist can exploit under the new modes of production. Marx saw this change in the nature of the servitude of the labourer as an advance; as a progression, abolishing as it did serfdom, and creating the free labourer who was not bound to the economic structure of feudal society. He has 'become a free seller of labour-power', free from the demands of the land, and from the dominion of the guilds and their impediments on production. According to Marx, the wage-labourer was free in a double sense. He could carry his labour-power as his own commodity and at the same time have no other commodity for sale. 'Free labourers' were one of two types of commodity-possessors, the other being the owners of money, means of production and means of subsistence. As feudalism broke down, and as feudal lords disbanded their numerous retainers, a period of 'universal vagabondage' began as the unattached wandered the countryside. Further to this, the advance of agricultural technology and the conversion of fields into pastures caused the displacement of large numbers of peasants, who flocked to urban centres. The large movement of serfs, peasants, and vagabonds moving and residing in urban areas provided the army of labour required in the new industries. Thus the owner of the means of production meets the free-labourer selling his labour-power in exchange for a wage. The historical moment from feudal serf to wage slave is now accomplished. Labour could now be bought and sold in the market, like a product. Marx saw this not only as a change in the form of servitude, but as a transformation of labour into a commodity. Along with this change in the social relationships from the feudal means of production to the capitalist, was the change in the nature of the product. Under the capitalist mode of production, products became commodities in that they did not just have a use value, but an exchange value, and in fact were produced especially as exchange goods (ie, trade goods). The use value of the product becomes incidental to -- and separate from -- its value as a trade good. A commodity 'may not be produced as the immediate means of subsistence of the producer himself'. Commodity production can only occur using the capitalist means of production, isolating the worker as a supplier of commodity labour. 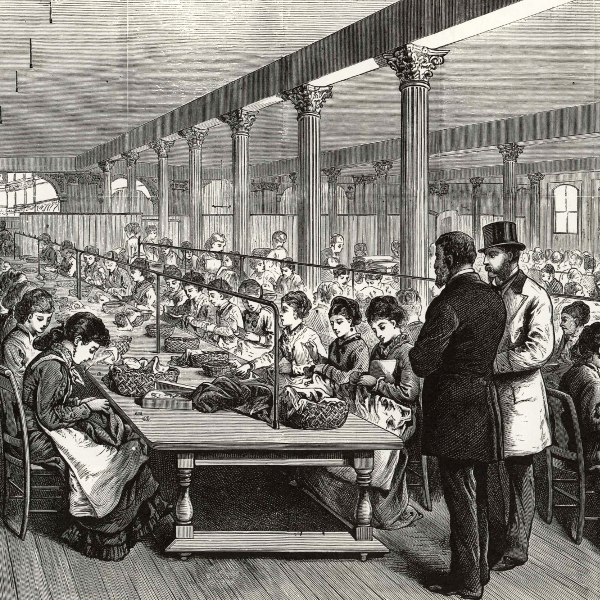 The capitalist mode of production was 'an epoch-making mode of exploitation' through 'its organisation of labour and its stupendous technical progress.' Thus, the productive forces emerging out of the industrial revolution would come to compel all nations to adopt the bourgeois mode of production. Marx accurately foresaw a 'universal interdependence of nations', with the capitalist mode of production infiltrating every national boundary. Through its exploitation of the world market, the capitalist class has given a 'cosmopolitan character to production and consumption in every country'. Marx admired capitalism as a superior economic system because it could overcome basic human needs; significantly, he viewed it as an historical inevitability, as a step along the path of humanities destiny. This almost religious fatalism colours most of Marx's analyses, frequently disguised by use of the word 'historical'. His frequent resort to the use of paradox is most reminiscent of religious rather than 'scientific' thinking (eg, a small example, 'The animal becomes human, and the human becomes animal', Alienated Labour, 1844). Marx's approach to history is reminiscent of the religious rather than the scientific mind, thus caution is required in accepting his theses, in particular because they claim to be the antithesis of religious or metaphysical thinking, based upon a scientific pretence Marx called 'historical materialism'. His view of capitalism as being some kind of pre-determined historical inevitability also betrays his 'religious' orientation, and should sound warning bells within the minds of critical readers. A major problem with Marx's works -- quite apart from the unstructured, obscurantist and turgid prose -- is that he is writing with an agenda; he writes both as a propagandist and as a social observer. Indeed, most of this agenda is necessarily concealed. Marx's writes of 'sovereign self-governing towns' as being 'the crowning glory of the Middle Ages' refers to a particular utopian communistic archetype of days past. The 'self-governing town' was often used as a historical back-reference by the Anarchists of the time that Marx wrote this article. Marx's mention of this is possibly testament to the influence of Anarchists within the International Working Mans' Association, an organisation which collapsed a few years after Marx wrote 'Origins and Development of Capitalism'. This collapse was entirely as a result of friction between the dogmatic and authoritarian Marx, and the significant Anarchist contingent within the organisation, amongst them activist Michael Bakunin. Marx's writings must always be held up against the backdrop of his contemporary context, and his personal and political struggles with and against other strands of communistic thought of his time, most importantly, the Anarchists. Whilst ostensibly writing as a kind of sociologist, Marx also had clear propaganda aims within the International and within that group of intellectuals participating in the socialist discourse in Europe at this time. This confusion of roles further undermines the credibility Marx's work.